Discussion in 'Eschatology - Endtimes & Prophecy Forum' started by Douggg, Mar 1, 2017. Regarding 1thessalonian5 saying peace and safety right before the Day of the Lord begins, there are two basic views on how that is going to be fulfilled. View 1, The prince who shall come person confirms a peace treaty, having a 7 year stipulation of some sorts, involving Israel. Under this scenario, it is not necessary for the person to be a Jew. This scenario in large part is based on Daniel 8 that he destroys many by peace. View 2. The person who becomes the Antichrist, anointed the King of Israel, confirms the Mt Sinai covenant for the 7 year cycle required in Deuteronomy 31:9-13. This scenario requires that the person be a Jew. Which the Jews will think they have entered the messianic reign of peace and safety. My view is this one. Both views are wrong, as it will be the soon to happen, terrible Day of the Lord's wrath, by fire, earthquakes, storms and tsunamis, that will set the scene for the establishment of a One World Govt, initially ruled by 10 Governors, but quickly taken over by another charismatic man. In no way is he anointed the king of Israel, Iv'e no idea where you get that from. Alexander dies young and 4 leaders of his army take over for a time. Caesar and the Roman Empire prospered and claimed to be God. killing and enslaving many in the known world when at peace with them though occupying them. Killed Jesus. The Roman Empire wasn’t conquered. It just broke up. This is the verse in Daniel 8, that them who hold view 1, base in large part of peace treaty being the covenant in Daniel 9:26-27. Daniel 8:25 And through his policy also he shall cause craft to prosper in his hand; and he shall magnify himself in his heart, and by peace shall destroy many: he shall also stand up against the Prince of princes; but he shall be broken without hand. Persons who subscribe to view 1 also cite the peace and safety in 1thessalonian5, as being the result a peace agreement that the prince who shall come confirms. I personally don't hold that view 1, but I am just trying to give the rationale of the predominant wide spread view 1. This one...Daniel 8:25 And through his policy also he shall cause craft to prosper in his hand; and he shall magnify himself in his heart, he shall also stand up against the Prince of princes; but he shall be broken without hand. and by peace shall destroy many: When people were at peace the Romans destroyed them. But he will be broken without human agency: The roman empire wasn't conquered by people. Daniel 8:25 is about the roman empire period not the end times in this chapter. It all follows in chronological order and has synergy with other chapters. One view allows a Muslim to be the 'antichrist' and give the Zionists a pass. The other view implicates Zionists. When the 1st scenario happens, then the Zionist messiah gets off scot free. I'm just trying to say Dan 8 isn't a part of Thessalonians and I think your mixing your prophecies together when you shouldn't. My own take on Daniel 8 is from Daniel's time everything in Daniel 8 was future. From our time, parts of Daniel 8 are historic. But there are parts - the parts about the little horn are future because that the vision of the transgression of desolation is said in the text to be time of the end. Okay, there is a transgression of desolation of the sanctuary to take place, concurrent with the stopping of the daily sacrifice. So there has to be temple built of some sorts built on the temple mount. Not there yet. The transgression of desolation is an act - which is why it is called a transgression, and not an abomination, which is a thing to be setup. The transgression of desolation will the act that the person, who will be the King of Israel at the time, commits by going into the temple, sitting, claiming to be God. That's in 2thessalonians2:3-4. Backtracking in 2thessalonians, before that act there is a falling away from Christianity. Why so? Because the person, who becomes the Anti-messiah, that is, King of Israel, will be so convincing that he is the true messiah, that many in Christianity will fall away from believing in Jesus. So the person having been anointed the King of Israel will be because the Jews following Gog/Magog with think they have entered the messianic age of peace and safety - which is the peace and safety mindset in 1Thessalonians5. That is the connection I make with View 2. Everything is hinged on the person becoming the Antichrist by being anointed the King of Israel. After he reveals himself as the man of sin - his time as being the Antichrist King of Israel role will be over - because the Jews will reject him as continuing as their king, and they will turn to Jesus. That's maybe an oversimplification because there will be the over three years of testimony by the two witnesses the whole time, telling the Jews what is going to happen. Yes, that's what I am saying view 1 allows as a possibility. I disagree with that view, but I think it is the most wide spread view. That prince is the antichrist launched by the 1st seal opening to win false peace in the world, and the whole world will say Peace and Safety. Then after a short period of Peace the 2nd seal shall be opened, the Peace shall be Removed and people will kill each other. I've gone to a fair bit of trouble to show a interpretation that makes sense with what is said and does seem to fit Christ and Cesar and the roman empire that spans many hundreds of years. Dan 2 doesn't mention an end time anti Christ and I don't feel 8 does either. Some of what you say is possible and I do believe there is an end time anti Christ spoken of in Thessalonians and revelation. THere are other plausible thing as well. THis why I at wait see in a lot of it. Dan 9:25 there will be seven ‘weeks,’ and sixty-two ‘weeks.’ It will be rebuilt with streets and a trench, but in times of trouble. 26 After the sixty-two ‘weeks,’ the Anointed One will be put to death and will have nothing. The people of the ruler who will come will destroy the city and the sanctuary. Because Daniel didnt even know that Gentiles will inherit the Covenant first thru the present Church Age, then will come the FINAL WEEK. Ephesian 3:6 This mystery is that through the gospel the Gentiles are heirs together with Israel, members together of one body, and sharers together in the promise in Christ Jesus. Daniel 2 does not mention a singular person I agree. There is no mention of Antichrist in any passage in the Tanach by that term. The term Antichrist itself, by tradition and habit, has been misapplied too broadly to the person. Being the Antichrist has to be looked at more as a role the person is in for a period of time. At other times, he is the revealed man of sin (no longer in the role of being the Antichrist) and the little horn, and the prince who shall come, and the beast - which those are other roles, which he is not the "Antichrist". The wait see is before the person ever becomes the Antichrist, he first appears as the little horn - leader of Europe, which is not at that final form yet. When Europe goes to that ten leader form of government, sometime before 2030, probably a lot sooner, that person is going to stick out like a sore thumb. The reorganization of the European government is what to watch for. No where does it say to add the seventy week at the end. Not in that chart and interpretation. Go to Ezekiel 39, where that chart and interpretation fails. Following the feast on Gog's army in 39:4 is 7 years. That 7 years is the seventieth week. In Ezekiel 39:17-20 is a second feast,a different feast, not a repeat, - the Armageddon feast. Verse 21, Jesus having returned to planet earth, among the nations, ruling with a rod of iron. Verse 22, Israel the Jews will know God as Jesus in that day. Before Abraham was "I am" John 8:58. Verses 23-24 relates back to when Jesus said because they rejected him, their temple would be destroyed, Jerusalem surrounded and taken, and the defenders killed, and the Jews exiled to the nations. All happened in the three Jewish revolts against the Romans. The last revolt being the bar Kokhba revolt in 132-136 AD. Verses 25-27 is where we are on the timeline right now. Israel a nation again, Jerusalem in the hands of the Jews. Islam profaning God's name as Allah. The Lord is going to defend Israel when Gog/Magog attacks. Verses 28-29 the Jews are going to know that Jesus is the Lord their God who entered this world taking on flesh, to die for the sins of mankind, and ascended back to heaven, and will be returning to execute judgment on the wicked in verses 17-20 of this chapter. Verse 28 corresponds to Matthew 24:31, the gathering of the elect, who will be the Jews who will be Christians at that time, back to the land of Israel. Dougg, please don't mix up Armageddon with Gog/Magog. They are plainly two different wars. Israel has 70 weeks to repent acknowledge God and to anoint the most holy and Reckonise Christ. The decree to build the temple goes out. 70 weeks. Then the temple is built again. 62 weeks even with Israel having wars and being enslaved by the Romans and other troubles. Christ is crucified to save mankind. The Romans attack Jerusalem and sack the temple around 70 ad. The prince Titus son of Cesar carries it out. There are more wars and desolation's to continue. Christ becomes the temple spiritually and brings forth the New covenant. Israel becomes desolate generally and Israelites lose control of it. Daniel was a pretty amazing prophet. Yes, BUT....as they say.....Jerusalem, arrival of Messiah the Prince - that was the passover week that Jesus rode into Jerusalem riding the donkey, their King (messiah) in Zechariah 9:9, O daughter of Jerusalem , hailed as the messiah, King, son of David. 4 days later he was crucified. Sorry, but no new covenant mentioned in Daniel 9, as a covenant - because the new covenant involves both the being cutoff and the resurrection - see my avatar, that is the new covenant represented, the cross and the empty grave. There is nothing in Daniel 9 mentioning the resurrection. The seventieth week is in Ezekiel 39 as well, as I pointed out. It is also in Revelation 12, by time units, 1260 days Revelation 12:6 plus the time, times, half time in Revelation 12:14 - together are the 7 years. uh.... I assume you are talking to me? Two doug's here. One dougangel, and me Douggg. if you were addressing me, keras, please don't mix up what I wrote... . Gog/Magog is not Armageddon. Two different events. Armageddon is in Ezekiel 39:17-20, 7 years after Gog/Magog - which Gog/Magog is also in Ezekiel 39 but only in Ezekiel 39:1-16. Wow your critical of that. In the context of what Daniel is talking about in chapt 9 that fits. There may be end time chapters in Daniel. Chapter 12 says end times in NIV that might be a clue. History may even repeat itself. I added New covenant being preached as the gospel to gentiles because that what happened after 34 ad I not saying Daniel said that.It fits into the end of that week. and it is the start of the church age. Wow do u not understand that Doug ? People keep adding different chapters and prophecies in Daniel to what I'm talking about. I not talking about chapter 12. Although there are some things the same. 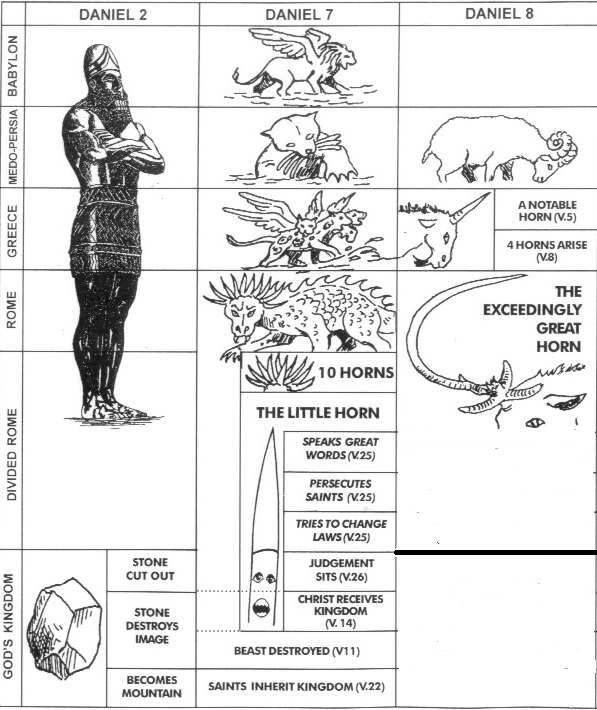 There are different things in the different chapters of Daniel. There different prophecies. verse 24 mentions "anoint the holy" that is Jesus's baptism at the start of week 70 not the Passover. Its the start of Jesus's ministry.